Babies are resilient. I learned that at Harvard. 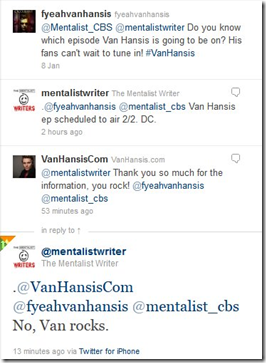 Air date and photo released for Van Hansis’s appearance on THE MENTALIST! Okay, first things first – episode promotional stills are out, and Van’s in one! Check out the long hair! 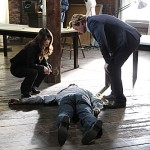 And here’s the caption: Jane (Simon Baker, right) narrows down the list of suspects after a disgraced clothing designer, on the verge of a come back, is murdered. Also pictured are Griffin Matthews (far left), Van Hasis (center) and Riley Voelkel (near left), on THE MENTALIST, Thursday, Feb. 2 (10:00-11:00 PM, ET/PT) on the CBS Television Network. And more good news: it’s a big enough role to get him featured (and named) in a publicity caption. Woo hoo! In the meantime, the above photo, plus much of the following information wouldn’t be possible without thanks in advance to the astute tweeter from the fuckyeah Van Hansis! tumblr who thought to ask THE MENTALIST writers for an air date. Thanks also to the folks who posted it at the lure_atwt LiveJournal and to Van’s fan’s who posted it on his Facebook page. 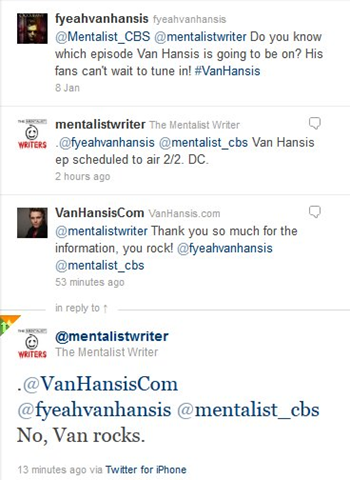 And finally, thanks to VanHansis.com who screencapped the twitter conversation . So yeah, basically, I’m the last one to know. In the meantime, there is widespread confirmation on the internet that the Feb 2nd episode = episode 4×13 = ‘Red is the Next Black.’ There are also reports of this being a “fashion-themed” episode (given the title, that’s not a surprise). 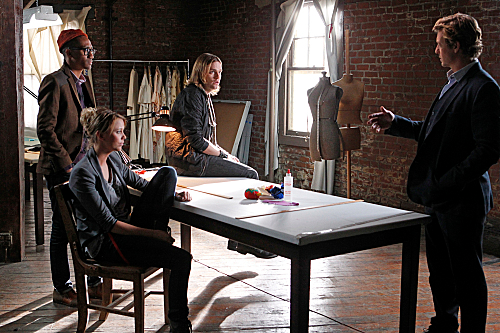 Jane and the CBI narrow down a suspect list as to who killed a disgraced clothing designer on the verge of a comeback. Meanwhile Agent Darcy continues her investigation into finding Red John. Airdate: 2nd February. This entry was posted on Thursday, January 12th, 2012 at 1:10 pm	and is filed under News/Updates. You can follow any responses to this entry through the RSS 2.0 feed. You can skip to the end and leave a response. Pinging is currently not allowed. ← View Van Hansis’s demo reel! Plus PSYCH meets THE MENTALIST? I saw the episode of THE MENTALIST last night with Van. He certainly has gotten away from his “Luke image”. Nicely done. Just wish that he could get a meatier part for some of these TV appearances. This is good news for Van – can’t wait to see it! Does anyone know what Eric’s been up to since finishing taping for IHMTD? Is he and his family still in L.A. or have they come back to New York? Does he have anything else in the works? Where are you living these days? I know you’re a diehard New Yorker. are no seasons in L.A. I’ve been homesick since October. it’s the best of both worlds. New York soon for ten days. Then I’m back to LA to see what happens…. So what else are you doing? Oh, of course! I’m not in the upper one percent. I’m in the 99-percent group! am right now because I’m renting two houses in two towns! Thank you so much lovelure! I knew I could count on you for info.